Yarn Folk | Treasure hunt this weekend! Please note: final class date has shifted by one week. Some of this is merely my luggage. A number of TNNA vendors bring not only samples of their wares, but merchandise that is available for cash and carry. It’s a fun way to test out products in the shop and to offer a taste of things that may not be permanent additions to the line up. Rather than putting my cash and carry purchases out immediately, I decided to host a treasure hunt this weekend. From Friday through Sunday, you’ll have the chance to fill out a card identifying new items I brought back from Portland. Identify five, and you will be entered into a drawing for the Penelope Cowl kit, featuring yarns from Lorna’s Laces, Oink Pigments, and Anzula, and a pattern that can be either knit or crocheted. Identify all eight, and you’ll get two extra entry tickets. The merchandise will also be available for sale, so the sooner you play, the better your chance of being able to find all the goodies! I think you’ll find new treasures to delight in, and may the odds be ever in your favor! February is a great month for fiber-themed Instagram challenges! There’s #28DaysofYourLYS, begun last year by Rachel of Woolyn in Brooklyn, NY. 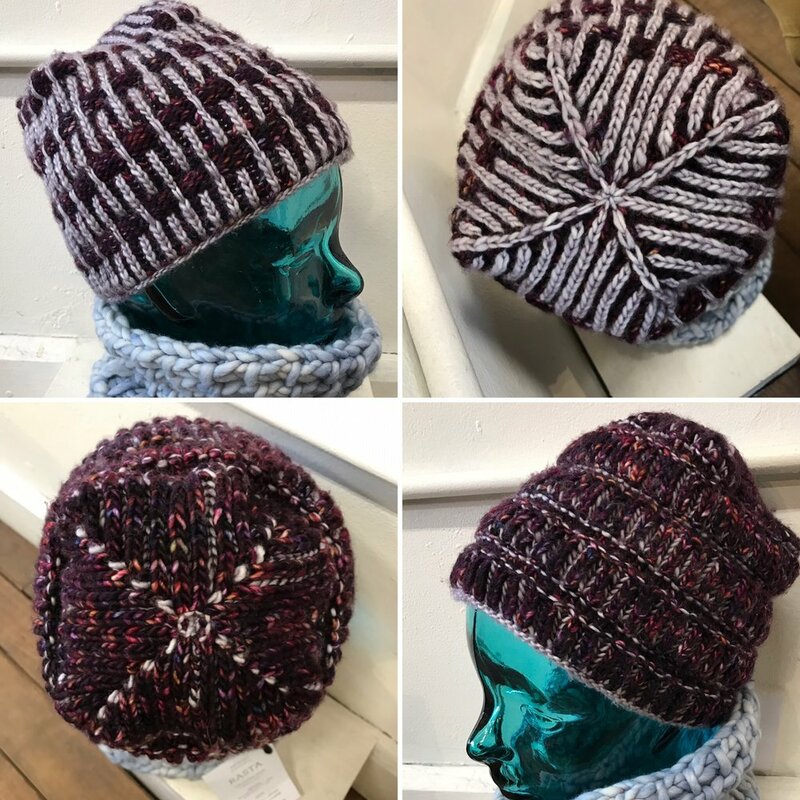 This year, Sarah from Knot Another Hat in Hood River, OR jumped in to help refresh the prompts while Rachel was vending at Vogue Knitting Live in NYC. The #FiberuaryChallenge is the brainchild of @creativececi, and the #yarnlovechallenge comes to us from Ravelry’s Mary-Heather and Christina. You can follow a hashtag the same way you can follow an individual, so check out any of these for some late* winter inspiration. 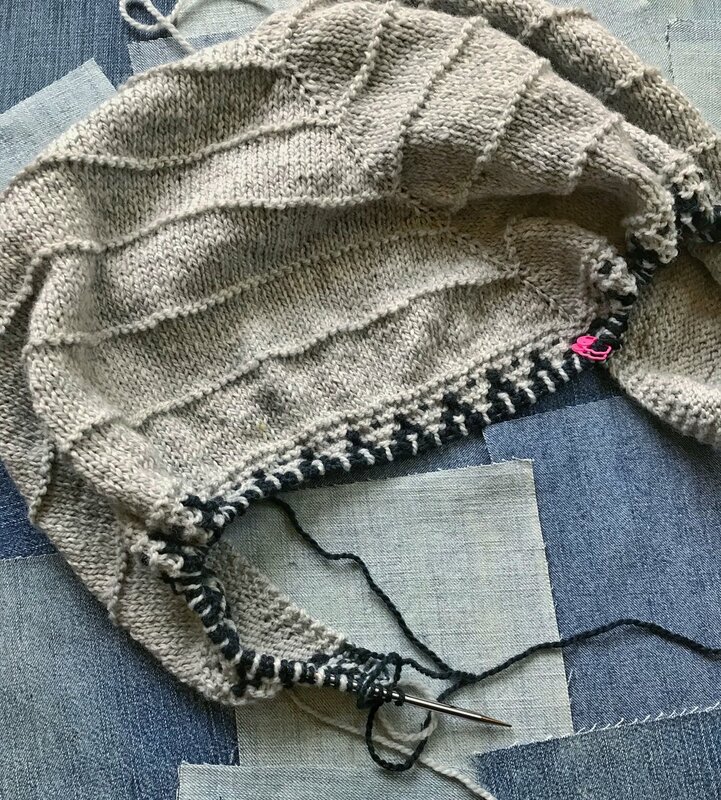 While I’ve knit both the front and back of the January Gansey to the point where they are joined via Russian grafting, I haven’t had a moment to sit down, concentrate, and try this technique. I can do kitchener stitch in my sleep, but Russian grafting is new to me! The main color section of the Boho Style Mosaic Shawl made for perfect travel/in-class knitting. Long stretches of stockinette allowed me to focus fully on what was happening inside the classroom, and the simplicity of the fabric and weight of the yarn made it easy to put down when I wanted to take notes. Upon arriving home, I started the garter stitch mosaic section. With just one color in play for each row, it’s a simple form of colorwork, but watching the pattern emerge is just as gratifying as stranded knitting.